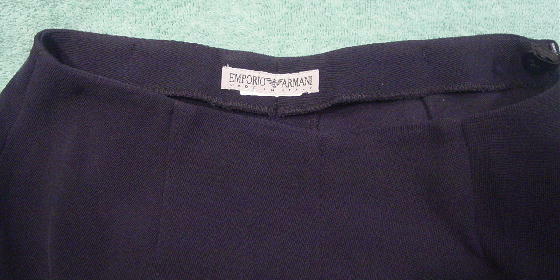 These black pants are by Emporio Armani and were made in Italy. They have an elevated cross thread texture which is soomewhat see-through. They have a 7" long left side zipper and an interior fabric tab buttonhole and black button closure. The fabric tag has been cut out, but the fabric does have a little stretch to it. They were worn in a movie. 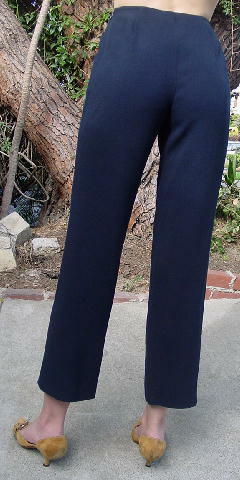 The pants were hemmed to fit the actress. waist to hem 37 3/4"
bottom leg openings 7 1/2"